Make breakfast for the week on Sundays. You’ll be really happy that you took a few minutes to prepare your breakfast ahead of time so that its ready to grab and go during the week. Steel Cut Oats – cook and portion into single serving glass containers. Heat and eat one each morning or transfer to a thermos to keep warm. Add fruit such as berries or banana. 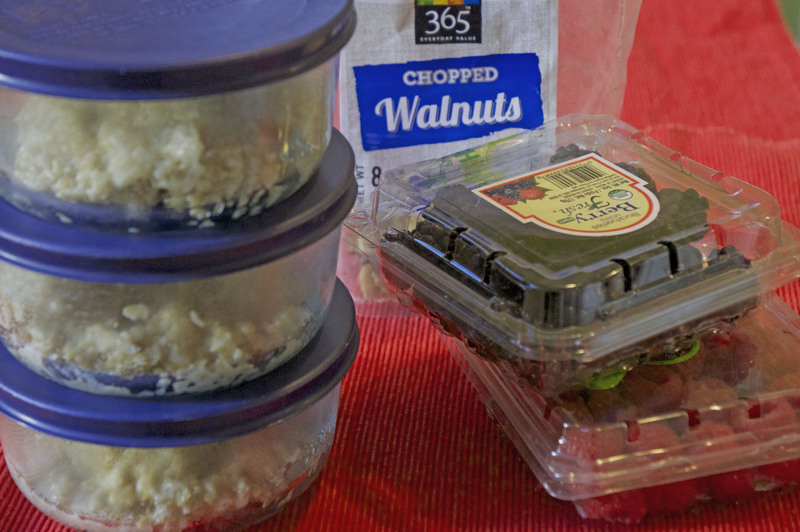 Add a few chopped walnuts when you’re ready to eat it. Delish! Hard boiled eggs – pair with a banana or other fruit to accompany the lonely egg. Muffin Tin eggs cook 8 and reheat 2 in the morning or add them to a thermos to keep warm until ready to eat. Quinoa breakfast cereal. Cook and portion into single serving glass containers and reheat or place in thermos to go in the morning. Chia Seed Pudding. Portion into single serving glass containers. Pre-prepping some easy no frills sides and bases can help you avoid the take-out menu. Keep a few frozen rice and bean burritos or other ‘healthy-ish’ frozen foods in the freezer for emergency meals. You can pair the burritos with avocado, salad that is mostly prepped and some steamed veggies for a quick meal.